Billy Slater’s last game at AAMI Park started with a bang, as an error from Ricky Leutele and a hand in the ruck from Luke Lewis handed Cameron Smith a penalty kick four minutes in. From there, both teams ground down and went set for set, as Aaron Woods put in a great trysaving tackle on Slater, Tim Glasby was winded and then sent off with a rib injury, and Billy the Kid settled in for one of his most emphatic games of the 2018 NRL season, despite clocking up a shoulder charge in the first stanza. While the Sharks managed to hold their own, the Storm were clearly the dominant outfit, as Cronulla barely got a chance to attack within Melbourne’s half of the field over the opening twenty minutes. The last tackle options from Chad Townsend were particularly problematic, as were the accompanying kick chases. Several times, Slater was able to catch the footy on the chest with no dramas, while at one point he leapt up to greet the high ball and then slammed to ground with not a single Cronulla jersey around him, expecting a contest from Valentine Holmes that never came. Still, Slater’s night was blemished by a deliberate shoulder charge on Sosaia Feki that prevented the Cronulla winger scoring the first try of the night, and probably played no small part in Feki being led of the field for good with an AC injury ten minutes later. It was a moment when the Sharks should have felt the rage and consolidated, but instead they fumbled their first and only real bout of field position in the first forty minutes, which came shortly after. Last week, the Townsend-Moylan combination had been brilliant against the Panthers, but the Cronulla halves dropped the ball – literally – early in their first big attacking opportunity, after some miscommunication from Townsend led Moylan to believe that the footy was actually heading across Woods on his outside. With Fifita and Lewis leaking successive offside penalties, Smith barked at his men to touch and go, with Nelson Asofa-Solomona almost making it across the chalk a tackle later. While Curtis Scott might have knocked on as the Storm shifted the Steeden across to Josh Ado-Carr, the purple army got a chance to build upon the Sharks’ string of errors and mistakes on their next set, which started – once again – with Slater cleaning up a Townsend bomb with very little contest. A couple of tackles later, Croft send the football across to Felise Kaufusi, who fended off Moylan and offloaded to Slater, just before hitting the turf about ten metres out from the right edge. Slater read the play immediately, breaking through the line and popping the ball back to Croft on his inside, who responded with a deft right foot step to pivot around Townsend and utterly elude Holmes, who had been hedging his beats on Billy the Kid trying to cross over himself. Shortly after, Feki was sent off the field for good, leading to an even more depleted Cronulla bench in the absence of both Gallen and Dugan, as Scott Sorensen trotted onto the park to take his winger’s place. For a moment, the Sharks got some solace, as Townsend put in his best kick of the night. Still, with Slater cleaning up the footy once again, and getting away with an incorrect play-the-ball, the Storm regained possession, with an offside penalty for Sorensen getting them back up the other end of the field. Once they were there, Slater went from try assister to try scorer, gathering the ball on its way out to the right edge, only to dummy and then scoot around Moylan to put down four more points. It was an incredible display of speed for what might well have been Slater’s final game in the NRL, bringing the Storm to 14-0 once Smith had booted through the extras – a pretty imposing scoreline given that Cronulla hadn’t been kept tryless once over the opening half during the entire 2018 season. To his credit, a floating bomb from Townsend defied Slater three minutes before the siren, but the Sharks didn’t make the most of it, putting in one of their worst sets in several weeks. It started with some awkward and fragmented timing on the first tackle, which Matt Prior tried to correct with a quick run up through the ruck on the second. Sensing that nothing was happening on the left, Moylan shifted the footy over to the right, only for Kurt Capewell to show his relative inexperience on the wing by being sent into touch by Suliasi Vunivalu. If the Sharks had managed to keep out the Storm for the last two minutes, then they might have stood a chance at the wing, but two gestures of frustration from Andrew Fifita now laid the platform for Slater to put down a double. The first came on the opening tackle of the following set, when a crusher tackle from Fifita on Kenny Bromwich got the Storm down the other end of the field quickly enough for them to have a real shot at six tough tackles before the first stanza came to an end. Once again, Kaufusi almost broke through the line off a pass from Croft – a good omen for the Storm, especially once Joe Stimson stormed his way up through the ruck a tackle later. Finding himself with the football about fifteen metres out from the line, Smith took advantage of a renewed Fifita-Bromwich fracas, and a disrupted Cronulla line, to boot through a grubber for Slater to curve around and ground right beneath the posts. There couldn’t have been a more emphatic way for the Storm to score than a Smith-Slater combination, while there couldn’t have been a more dramatic way for Smith and Slater to reverse Fifita’s last-minute clutch effort against the Storm at the end of the 2016 grand final. In these final moments, then, Cronulla lost whatever residual power they might have held over the Storm since 2016, and so it was probably this try, more than any other, that ended up getting Melbourne the win. All in all, then, it was a pretty visceral moment for the Sharks, and for Fifita in particular, who was pretty pumped up as he headed into the sheds. While the Storm wouldn’t score another try – just another penalty kick at the sixty-fourth minute – Cronulla would never recover from this surge of Melbourne momentum. It might have been a very different game if Ramien’s putdown had been called a try three minutes into the second stanza, but with the Bunker holding that Edrick Lee had knocked on the high ball under pressure from Curtis Scott, the Sharks remained at zero until the sixty-eighth minute. Their sole try came off the back of a brilliant kick from Capewell at speed on the left extremity of the field. While Ado-Carr was waiting and watching, and reached the footy pretty efficiently, he was still forced to take it into touch, resulting in a much-needed dropout for the Sharks. Four tackles later, Joseph Paulo brought the Steeden right into the line, dragging Munster and Scott out of position before sending it across to Lewis for the first and last four-pointer of the night for the visitors. With Townsend adding the extras, Cronulla had made a small dent on the scoreboard, but it was too little too late, even if Melbourne didn’t get any more points either. 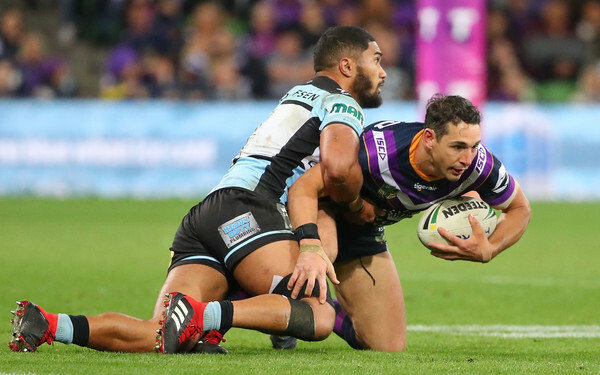 A deflating sequel to the 2016 grand final for the Sharks, then, but a galvanising game for the Storm, who will be waiting anxiously on the result of Slater’s shoulder charge as they prepare to take on the winner of Roosters-Rabbitohs in Sydney next weekend.